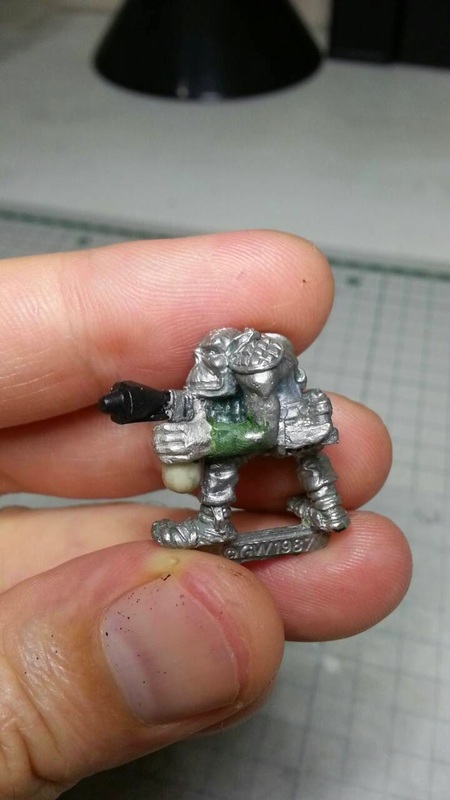 Mr Papafakis: Ork conversion bonanza! 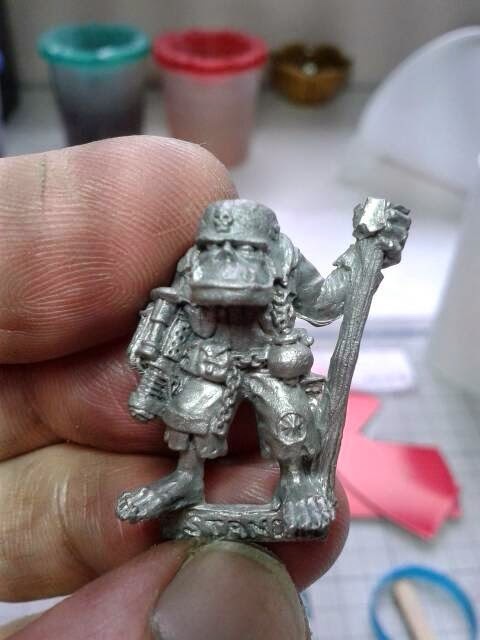 Now, even though I like the old RT sculpts, I can get a little bored of some lines.....specifically the orks. There were far too many mono pose, recycled minis in that range. So, when I was gathering all my greenskin's together -for basing & painting- I became a little disheartened at the prospect of applying brush to so many similar minis. Here's where conversion stepped in to saved the day! 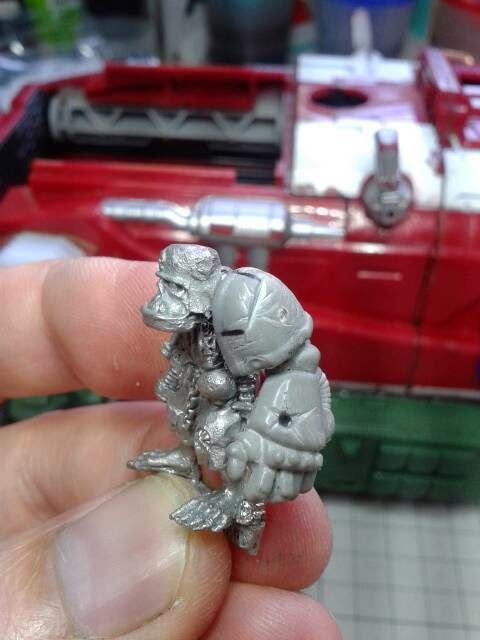 The first in the batch to get the amputation treatment was a red era ork. He was already missing a weapon, but I didn't want to replace it with another, so I cut his whole arm off. I cut his silly little spike off his helmet too. Red era, boo, hiss! "Get back ye devil!" Ahh, that makes me feel a little better. Ran some cables along his arm to bulk out his shoulder joint. 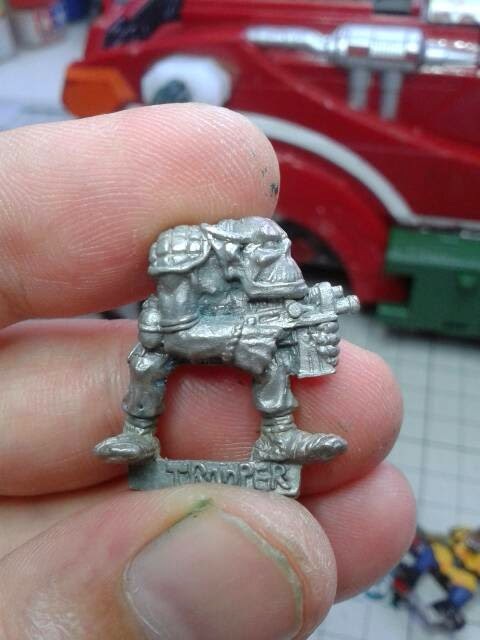 The next one was an old RT standard bearer, but the collection of space marine helmets had already been removed. Good riddance I say! 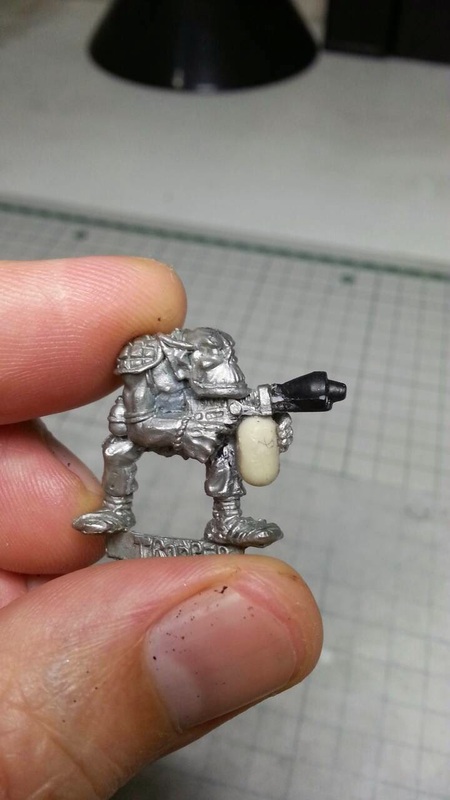 I don't like what GW tried to do with 40k in this respect i.e. transferring command sections from WFB into a futuristic setting. Makes no militaristic sense at all. So, I cut his arm off! Beginning to see a tend here, when in doubt, just cut the damn thing off! 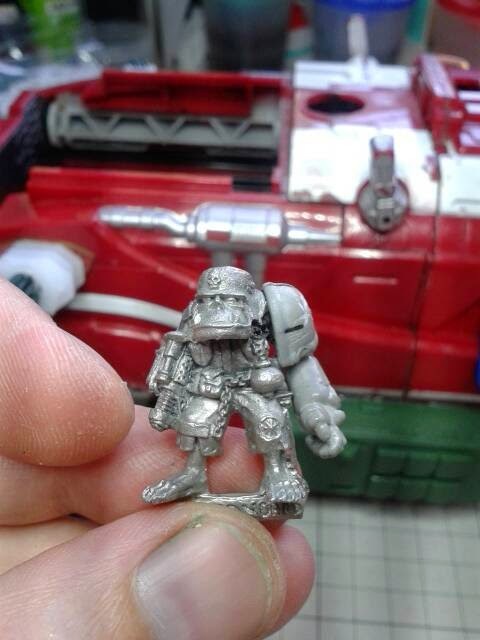 I replaced it with a space marine power first, sort of like he removed it from a dead marine & liked the fit. Who needs a standard bearer when we've got walkie talkies? Makes me look tough yeah? Don't worry about the damage, probably doesn't work, but hey, who cares! 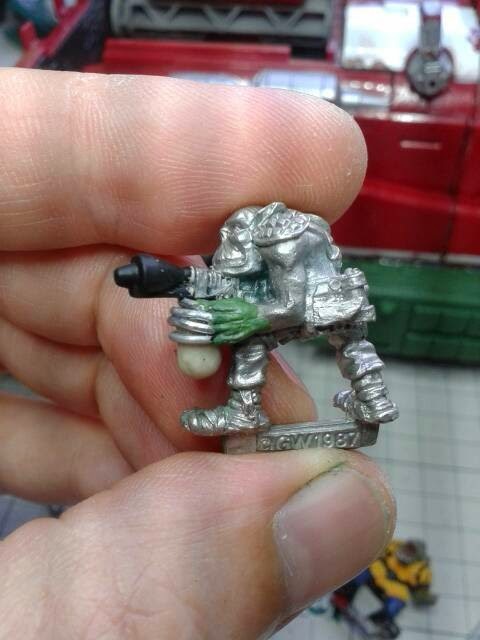 There's about a gazillion of these type of orks contained within the RBT02 Space Ork Raider's box set. Four Variations on the same mini, yawn! 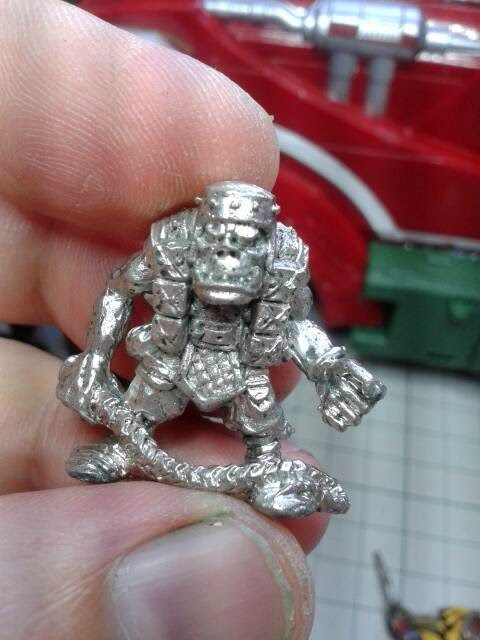 Cool mini, but overproduced IMO. So, I was looking at these guys pondering how I could go about sexing them up. Making them interesting enough so that I wouldn't fall asleep at my painting desk. I started to flick through my old trusty tome for inspiration. And then it hit me, looking closely at one part of Dave Andrews groovy diorama. It doesn't get any better than this, period. 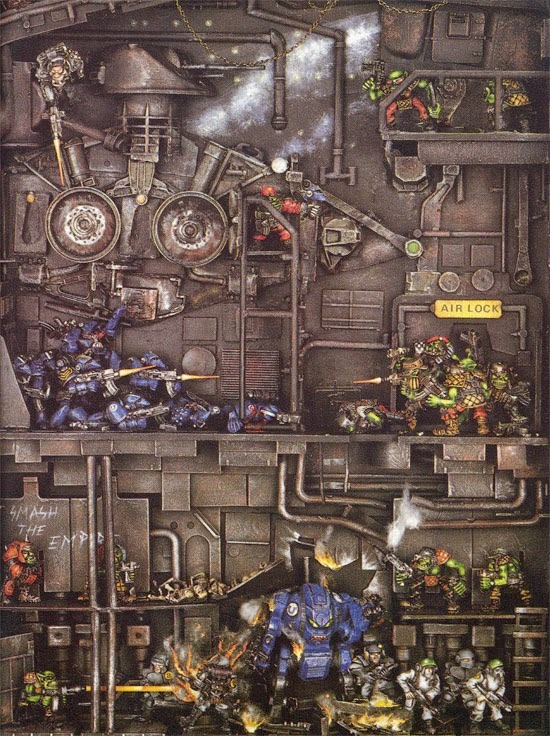 The ork in the bottom left -the one lighting up the trooper & the dreadnought- is using a flamer. 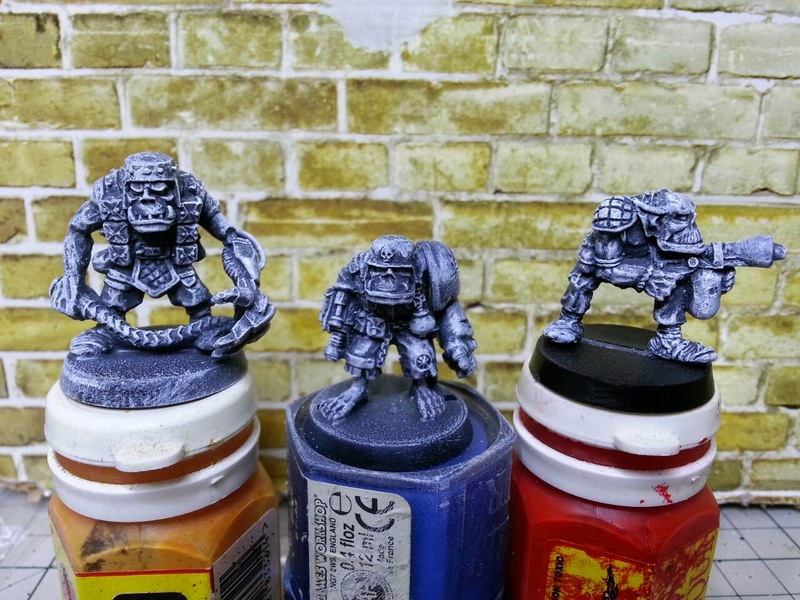 But these sculpts never came out with them. 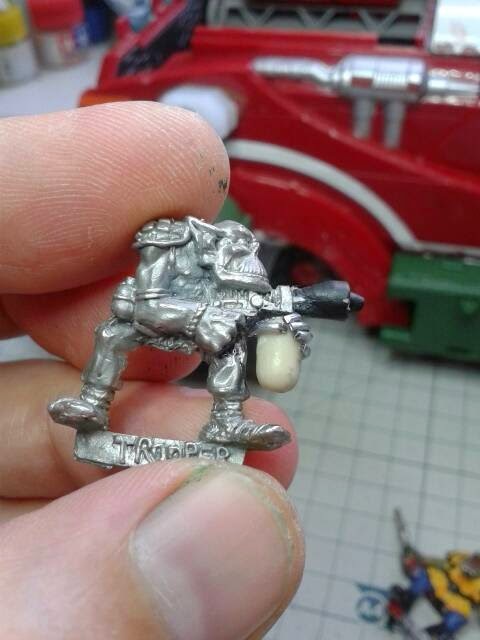 So, Dave Andrews (being a clever chap) grabbed a barrel & canister off of an RBT01 marine and bunged them on. The barrel conversion is easy, but the canister/magazine swap is not. The magazine is part of the hand, leg & arm. Removing it to for the canister would have been a pain. So how did he overcame the problem? He stuck it on the side, behind the original magazine (highlighted it to make it more prominent) & left it there to act as a handle, painting it matt black to hide it. You may be thinking "Is this guy for real? How could you not notice that? ", but it honestly didn't register. See how he hid the mag? Look's a whole lot better! Now I just have to paint up this horde & they'll be ready to kick in marine heads all day long. The cannister hand is a vast improvemnet. Well done Asslessman. Thanks for the praise, but I think Dave Andrews approach must have been dictated by time constraints. It still looks good though! Completely agree - It doesn't get any better than that diorama. 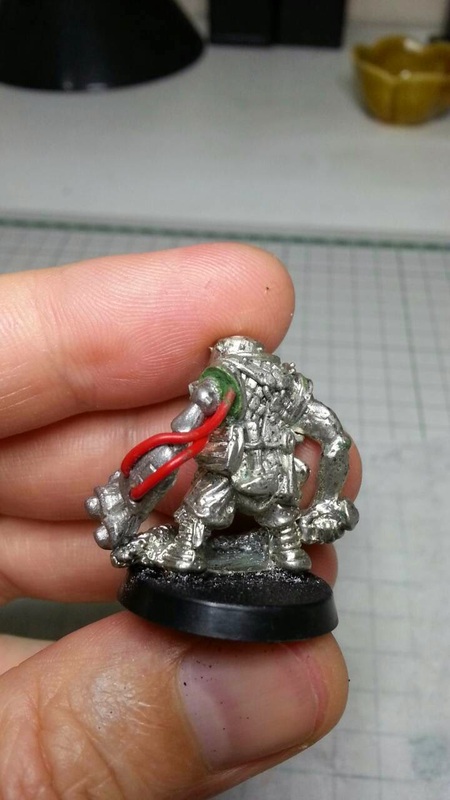 You've done a great job replicating the flame throwing Ork! Yeah, it's just a fact isn't it? Dave Andrews diorama is king! Started painting them this morning. Hopefully I'll have them done in a couple of weeks. The conversions look ace! Love them! 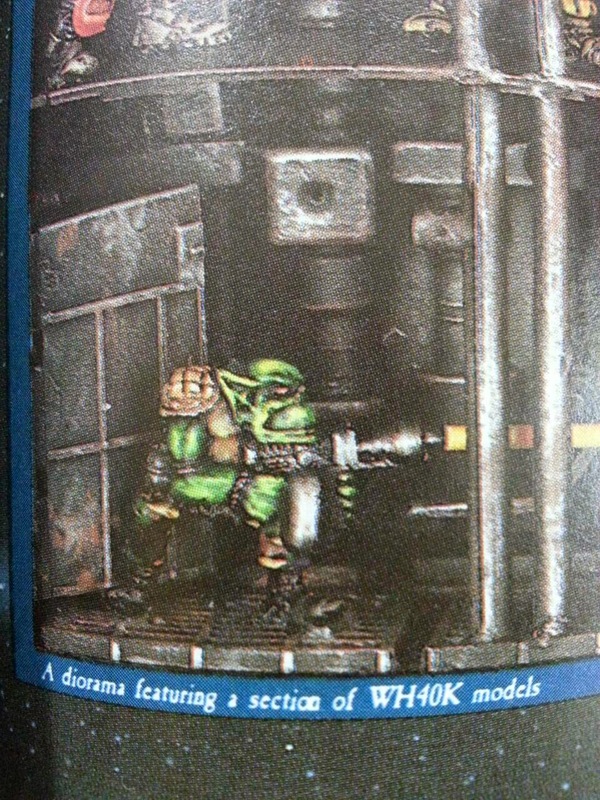 That diorama and the squat v. eldar diorama are two of my favorite things in all of Rogue Trader. Nicely done. Very very nice. For what it's worth, I suspect you were on the right track with your own hand. I think extending the arm forward a bit, covering the back part of the finger wires with hand, and shorting the front part of the finger wires a little and fleshing out with G/S would have gotten you where you wanted to go. (And you'd have come to that eventually no doubt.) But the prefab hand worked most nicely as well. Excellent stuff. I think I was on the right track, but it was just so painful. The picture of my botched attempt -before I gave up & asked if anyone had a spare hand on the forum- was like the third or fourth iteration. 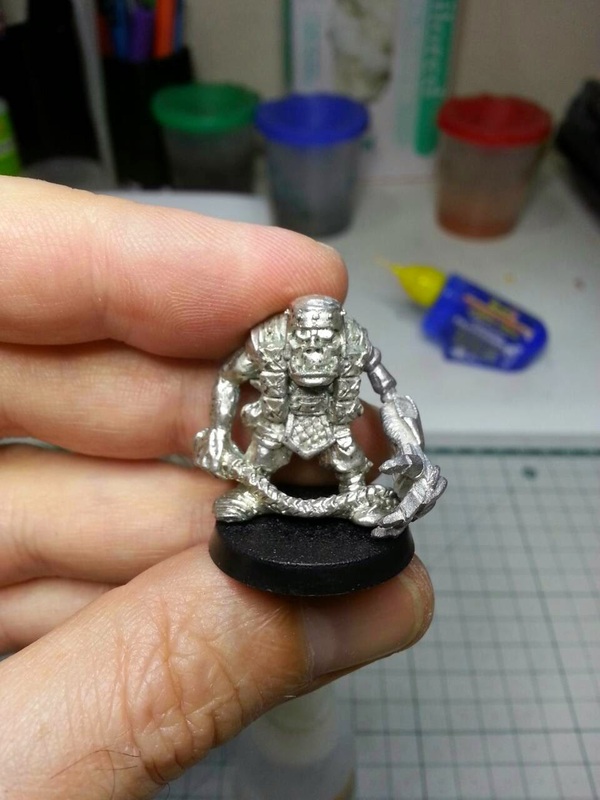 I tried carving up some metal hands I had, but they ended up being the wrong size. Then I tried reforming a plastic hand I had, but nope, it was a failure too. I agree, it was looking better, you're observation's about the fingers & arm being a bit too long were what I was thinking too. But in the end I just thought to myself "this is gunna take forever". Because the fingers were so small & fiddly I had to glue them in place everytime, so when it didn't work out, I'd have to break it apart again. Thanks for your words encouragement Composer, much appreciated. Those conversions really rock the casbah. You realy improved those models here. Maybe some putty sausages would have worked for the hand rather than metal wire but then using a hand to make a hand has got to be the best way ! I really like the wires you use, what are those if I may ask ? Rock the casbah indeed, I loves me some conversion work, gets the imaginative juices flowing. Which wires are you referring too? The one's I used for the hand or the cabling along the power fist? Tank's for the orks..... what a terrible pun!